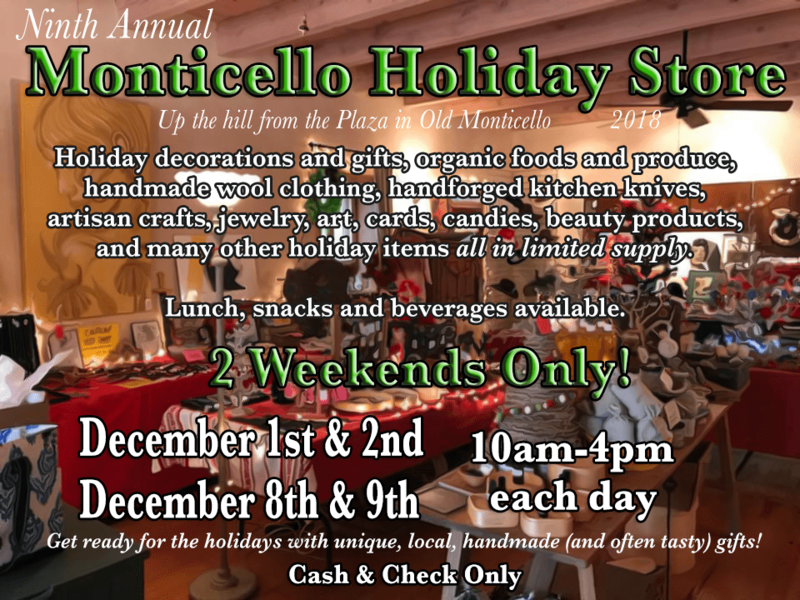 Join the residents of the Monticello canyon for the 9th Annual Monticello Holiday Store! You’ll find all sorts of wonderful handmade holiday gifts at the holiday store! Numerous local artisan crafters offer unique and beautiful gifts such as hand forged knives, handmade wool clothing, jewelry, scarves, mittens, lavender and herbal products, natural salves and soaps, artwork, holiday decorations, candy, baked goods, organic foods and so much more… all in very limited supply! It is impossible to adequately describe the wonderful selection of gifts we have in store for you this year. Come out and see what we have to offer! We promise you won’t be disappointed. Lunch, Snacks & Beverages will be available courtesy of South 40 Farms, who will also be offering extensive dried herbs, homemade jams, and more. This year the Monticello Holiday Store is proud to include an exclusive line of hand forged blades (including lots of kitchen knives! ), jewelry and other blacksmith made items courtesy of Ashe Cravenock, otherwise known as Ashe & Hammer, local blacksmith and recent Forged in Fire Champion. Ashe recently took home the title of champion on History Channel’s show Forged in Fire, Season 5 Episode 25 entitled The Sengese. We are also honored to feature the rare and wonderful Organic Balsamic of Monticello, a traditional barrel-aged balsamic vinegar which just so happens to be produced right here in Monticello, NM! Aging since 1998 in Italian barrels made from seven different woods. A truly extraordinary treat! Everything you’ll find at the Monticello Holiday Store is handmade by local artisans and crafters that live in the Monticello Canyon area. This is the perfect place to complete your holiday shopping for every member of your family! There are even gifts for the people in your life who already have everything- such as delicious homemade candies and baked goods. You can find natural, chemical-free lavender and beauty products, household items, and delicious, certified organic treats such as homemade harissa, spicy ketchup, tomato salt, caramel corn, and much more courtesy of Jane Darland. Ashe Cravenock’s hand forged blades are perfect for the hunters, fishermen, or chefs in your family. Lalynn’s beautifully natural, dye-free wool clothing- including mittens, sweaters, leg warmers, hats, skirts and more- will keep you cozy and warm through the winter season! South 40 Farms offers a wide variety of homegrown herbs, jams, juices, and more. South 40 Farms will also be providing Claudia’s fresh, homemade posole, featuring blue corn, red chile and pork for lunch, as well as beverages and other snack options straight from their farm. Original artworks, holiday cards, jewelry, toys to put under the tree for the little ones, locally grown organic produce, delicate needlework, and, of course, the Darland’s famous organic traditional balsamic vinegar! You can find all of this and so much more at the Monticello Holiday Store. We are located in Monticello, NM, about 40 minutes outside of Truth or Consequences. You take HWY 181 to HWY 52 and turn towards Monticello, which takes you onto HWY 142. Keep going until you arrive at the Monticello plaza and then just drive a few hundred feet further up the hill and we will be on your left!